We would like to welcome you to the future for the Houston Office 365 Community. 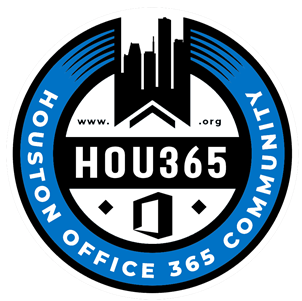 We started as the Houston SharePoint User Group, but have decided to move forward that involves everything available through Microsoft 365. SharePoint is still a building block for our businesses and now we can include so much more like Teams, Forms, Planner, OneNote, OneDrive and the list goes on. We are ready to begin 2019 with our first meeting on January 16, 6:00 p.m. to 9:00 p.m. We all be involved together to support Microsoft 365. Are you interested in speaking in one of our meetings? We are interested in you! Calling for all Speakers!! We have speaker slots starting January 2019 to every month’s 3rd Wednesday. Meetings are 6:30 – 8:30 pm CST. Join me as I walk you through some of the amazing changes and difficult challenges with Branding as Microsoft moves forward with modernizing the user experience in SharePoint. I’ll explore new ways to navigate and present content, new ways to design and brand your sites, and discuss how to modernize existing sites. I’ll also discuss some of the challenges that lie ahead. Whether you are looking to modernize your site or hold out a bit longer, change has come, and more is on its way. Let’s catch-up on branding and what the modern experience has to offer. SharePoint Architect and Evangelist, with demonstrated ability to design and lead implementation of enterprise applications exceeding business expectations.